Recent release “Vigilatus” from Page Publishing authors Brenda Heller and Jimmy Adams is a spellbinding continuation of the life-threatening adventures of Theo and Gracie, two teens who travel back in time to the horrific realities of 1930s-era Nazi Germany. Brenda Heller, a mother and grandmother who retired after thirty-four years of teaching at the high school and college levels and now fills her days with volunteer work, camping, trail riding, and hiking with her husband, David, and Jimmy Adams, a high school history teacher and coach who enjoys woodworking, running, and swimming and lives with his wife, Chelsea, two dogs, and a cat, have completed their book “Vigilatus”: a compelling novel starring two young adventurers in persistent and life-threatening danger on their quest for justice across the globe. Theo and Gracie are threatened by dark evil of the Hitler regime. With the help of the Watch, a secret society, the teens and their robot dog plan to leave Germany. They are smuggled into a castle where they discover their friend and guardian has been kidnapped. While Theo is trying to recreate twenty-first-century technology in 1930s Germany, a shocking discovery leads Gracie through a gypsy camp and into a living nightmare of an experimental house of horrors. A novel of action driven by actual history, ‘Vigilatus’ ends on American soil in one of the most devastating disasters of the twentieth century. ‘Vigilatus’ will take the reader back with Theo as he struggles to relive the horrors of Nazi Germany but realizes rewriting history would rewrite his world of the future. Published by New York City-based Page Publishing, Brenda Heller and Jimmy Adams’s book is a meticulously researched work and a must-read for fans of historical fiction. 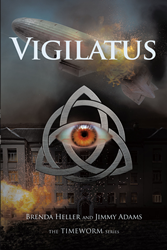 Readers who wish to experience this engrossing work can purchase “Vigilatus” at bookstores everywhere, or online at the Apple iTunes store, Amazon, Google Play, or Barnes and Noble.